Why Combine CoQ10 and L-Carnitine vitamin supplements? The synergy of the combination of L-Carnitine and CoQ10 vitamins is linked to the role they have in the biochemistry of energy. Both are naturally occurring substances that are found in virtually all cells of the human body and represent important factors in metabolic energy enhancement. This best combination of L-carnitine and CoEnzyme CoQ10 vitamin supplement not only supports the metabolism of fats, carbohydrates and proteins, supports the production of ATP (adenosine triphosphate), the "energy of life". A deficiency of L-Carnitine and CoQ10 may be associated with deficiencies in energy. Quite simply, L-Carnitine delivers the fuel and CoQ10 helps burn it. By combining these supplements together, the best utilization of effeciency of CoQ10 increases significantly, up to three times the effectiveness. Combining Coq10 and acetyl l carnitine is the best way to get maximum absorption of this supplement formula. As we age, the production of both CoQ10 and L-Carnitine decrease and relative deficiencies may appear overtime. Although abundant in grains, legumes and most meat, CoQ10 is often destroyed through processing and cooking. 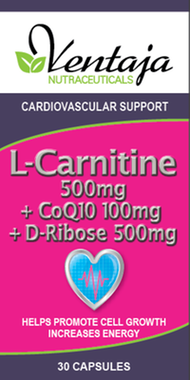 L-Carnitine, while available in meats, must be synthesized by the body from the amino acids lysine and methionine, and B1, B6, niacin, vitamin C and iron.